I must start out with a blog update. For those of you who have been following my blog (thank you) you probably noticed that I did not post a recipe or food related article last week. I recently decided to go back to school (yikes!) part time to earn a Master’s degree in Marriage and Family Therapy. This is something that I have wanted to do since completing my Master’s degree in Psychology many years ago. So, in addition to working full time, chasing a toddler and blogging I am now a graduate student as well. Last week got a bit crazy when I had a paper due. Academics had to prevail and recipe writing was put on hold. I really hope that school will not interfere with blogging too much as this has become such a passion of mine! 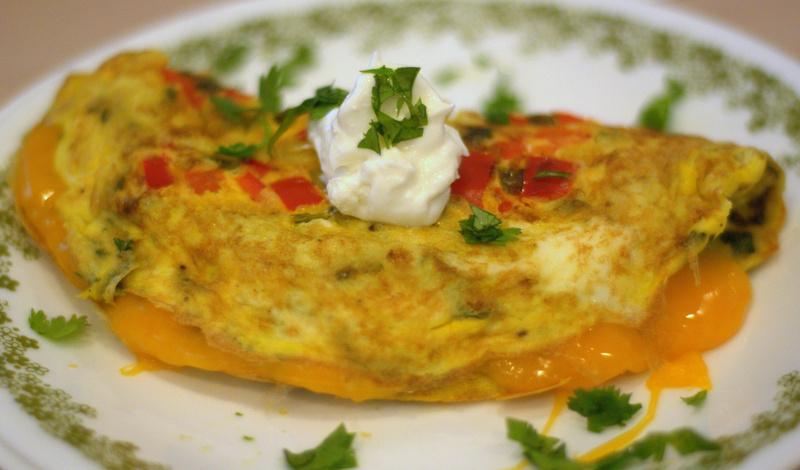 This omelet is an easy and delicious recipe that is perfect for breakfast, lunch, brunch or dinner. I have cut down on the calories and fat by using a combination of whole eggs and egg whites (as I do with all my egg recipes) and using low-fat cheese and sour cream. Another great thing about this recipe is that it can be halved to make for one or just as easily doubled or tripled to make it for more people. The hot sauce is optional and does not really add much heat. It just adds a really nice background flavor. If you would like it spicy you can always add more. If you are skeptical you can just leave it out. The avocado slices are optional but I really do recommend it! Heat the olive oil in an 8 inch skillet over medium heat. 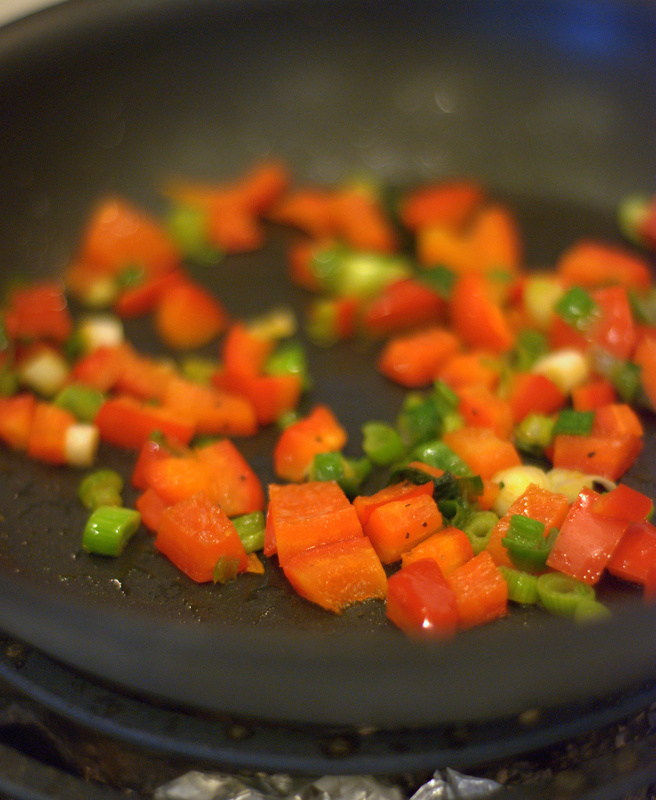 Place the peppers and scallions into the pan with a pinch of salt and sauté until the vegetables begin to soften. 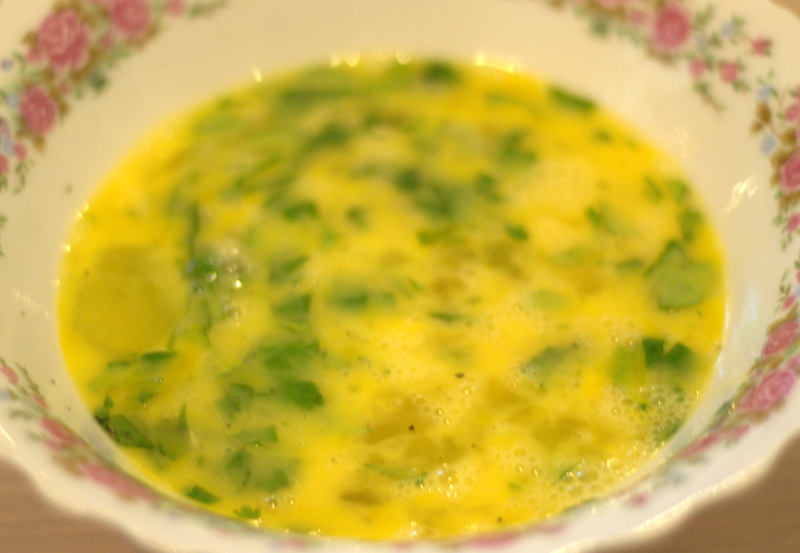 While the vegetables are cooking beat the eggs with one tablespoon of cilantro, hot sauce, salt, pepper and one tablespoon of water. 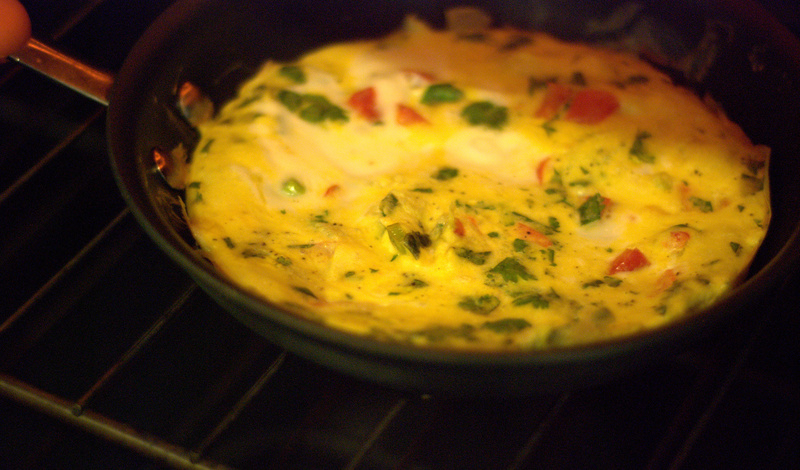 Once the vegetables have softened add the egg/cilantro mixture to the pan. Lower the heat to medium-low. Cook the eggs until the edges start to firm up. Loosen the edges of the eggs with a rubber spatula and tilt the skillet to let the uncooked egg run underneath. Once the bottom is firm carefully place the spatula under the egg and flip the omelet. If you do not think the egg will flip easily you can place the eggs under the broiler until the top is firm (about 3 to 5 minutes). This is my trick to perfect omelets every time! Sprinkle the cheese onto half of the egg. Flip the egg on top of itself to fold in half. 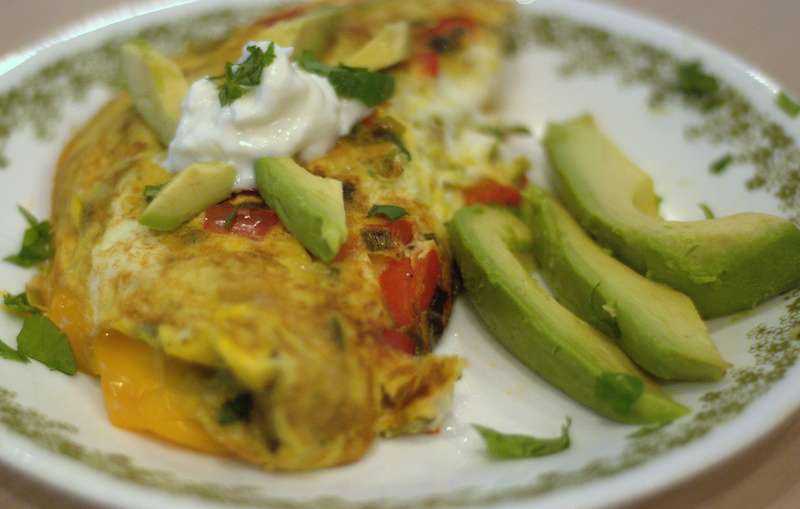 Cut the omelet in half and serve with avocado slices, a dollop of sour cream and sprinkle with cilantro.